Small local shop building custom one of a kind quality bobbers. We are full service motorcycle shop. We work on metric bikes, Harleys, sport bikes, dirt bikes, and ATV’s. We are a parts-unlimited, drag specialties, and lowbrow dealer. Our goal is to offer the most affordable prices on parts and service in the metro-plex. We are also a custom fabrication shop and do full motorcycle builds from choppers to bobbers. We specialize in old 4 cylinder bobbers with modern sport bikes suspension conversions and custom frames. 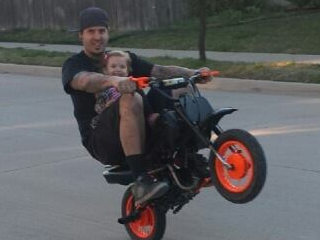 In addition, we can build damn near anything you want to customize your bike or set it apart from the crowd. Big or small we will build something to make your bike unique. Our store hours a pretty flexible and we stay open late most days and can arrange to meet up at most times if you need to come by after hours just call ahead. We are a parts unlimited, drags specialties, and lowbrow dealer. We sell new and used parts for most sportbikes, harleys, and metric bikes.